Unmapped Country: Why Do I Do This, Part Two. Lately I’ve been reading books that suggest, if not outright state, there’s something rotten in the state of Denmark – and by Denmark I mean the USA or Western Civilization, not just Denmark. And no, I’m not talking about reading Hamlet. First, there is Status Anxiety, by Alain de Botton (A de B). A friend brought it to my attention months ago, but I had no time to read it. Then this friend sent me a link to A de B’s entertaining and amusing TED Talk about the book, which is in part about the need to redefine success, and I finally buckled down and read it. The book’s thesis is that the current cultural obsession with “getting ahead,” a.k.a. “success”, is fueled by living in proximity to people with varying degrees of wealth and its trappings. Back in the good old feudal days, everyone lived in similar conditions, except for the feudal lords, so people didn’t mind their squalor. Since the Joneses next door had no more than you – you all supped from one giant pot in the open hearth – it wasn’t a big deal. Once industrialization and the rise of capitalism came about, though, differences in circumstances occurred and began to make people miserable. Ideas like equality of opportunity and meritocracy arrived. Put them all together in that big pot on the hearth and stir, and you come up with a bitter brew: the idea that prosperity relates somehow to merit, and therefore that poverty is dishonorable. The rat race, in other words. Now, as A de B said in his TED talk, we’ve done a good job of teaching people that everyone should have the same opportunities at the start of the race, but not a good job of helping them out after they break out of the starting gate. And lately, it seems as if we don't even help everyone get to the starting gate. So if they aren’t doing at least as well as the Joneses, they need Xanax and therapy and high credit card debt to appear as if they are. Which is a pretty unhealthy way for society to be. So there’s something to think over. But it’s not all bleak, according to A de B. The answer is to redefine success (already on it, A de B)! Now, there are several aspects to his redefining, but I haven’t finished the book yet. So far, I’ve read about how good old Philosophy can help. For example, if we remember that back in the Dark Ages, people were not blamed for their poverty, then we can detach ourselves from our obsession with wealth. Back in the Dark Ages, the idea was that Fortuna or Fortune or Fate was a giant wheel that turned, and sometimes you were up and sometimes you were crushed, and that had nothing to do with your inherent worth. This may seem somewhat cruel, but also it is somewhat freeing. People were not always defined by what they had, and you don't have to be, either. You don't have to feel worthless because you chose to write a novel that never got published, for a totally random example, because you can see that there is more to life than accumulating material goods. I'm still digesting that one, Readers, so I'll hold off on talking about the second book. 1. Vitamin B-12 deficiency because my feet were itchy and a friend’s daughter might have a vitamin B-12 deficiency. I asked the husband if I had a vitamin B-12 deficiency, because a friend’s daughter has one. He said no. You have dry skin, he said. (Incidentally, itchy feet are not a symptom of B-12 deficiency.) Nevertheless, I had itchy feet. 2. A foot fungus because I had itchy feet. I decided it must be a fungus I picked up from doing NIA barefoot at the Y. I was just about to call the dermatologist – in fact, I did call the dermatologist. However, the office was closed. It was either too early or too late to call, or it was lunch hour, or it was the day off, or something. Mars was in Mercury and Venus was retrograde or something. Fortunately, it turns out. Because right after I hung up, my feet stopped itching. Maybe it was the lotion I applied. Things that actually were wrong with me this week: Itchy feet. In other news, the 16-year-old has her learner’s permit and is taking driver’s ed. This means I’ve been in the passenger seat while the 16-year-old practices driving. I’ve only depressed the imaginary break pedal once, (that she noticed,) and only opened the window by accident whilst loudly suggesting that she not drive into the next lane while a car is passing once. I pass the time by reminding myself that I don’t believe this is the way I’m going to die. Which you, Readers, can note ironically in my obituary if I’m wrong. After all, what are these intuitions worth? Does anyone think they are going to die? I mean, on an ordinary day, when in ordinary health? No, no one does not. Which is why, probably, I can tolerate being the passenger while she learns to drive. Next week we head off to visit some colleges. 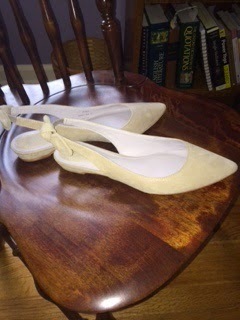 I got a really great pair of flats for only $38. Happy Passover. Happy Easter. Happy Weekend.